Home » april fools , bev perdue , comedy , george lucas , humor , movies , taxes , video games , weird al yankovic » April Fools 'Fess-Up Time, 2010 Edition! April Fools 'Fess-Up Time, 2010 Edition! You know what I like most about April Fools Day? It's that my birthday is March 31st. So for me it's like a two-day long extravaganza of hilarity and thanks to this blog, I get to share that good-natured nuttiness with a wide audience! Okay well anyhoo, obviously this year's April Fools Day on The Knight Shift was nothing like last year's infamous "Johnny Robertson arrested at the Vatican" stunt that saw this blog slammed with visits from such places as the U.S. State Department and Vatican City itself. This time, I wanted to do something a bit quieter, but no less funny. And as things turned out I wound up running three prank stories on this blog. 1. "Governor Bev Perdue considers a tax on all things NASCAR-related for the state of North Carolina": This one generated a surprising amount of traffic for the blog. More than I was expecting in contrast to the other two. Obviously not true, but also something that I could kinda see happening in a state that has gone crazy on taxation. 3. "Rock Band: 'Weird Al' Yankovic": AHHHHH the piece de resistance! I literally had the idea for this one during last year's April Fools Day, and kept it quietly to myself and a few trusted confederates since then. The "Cowcatcher Calamity Festival" bit, I've no idea where that one came from but it sounded plenty Weird Al-ish. 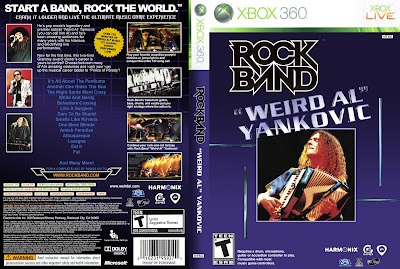 Lots of folks again thought this was the real deal (and just as many want this to be a real game, hint-hint Harmonix ;-) Incidentally, my friend and filmmaking collaborator "Weird" Ed Woody took it upon himself to make this awesome faux-Xbox 360 game cover for Rock Band: "Weird Al" Yankovic, loaded with easter eggs for sharp-eyed Al fans! And for the sake of good-humored confusion, I did utilize some links to real-life news outlets. Obviously GeekTyrant didn't really break a story about George Lucas rebooting Porky's, but they're such a terrific site that I wanted to give 'em a shout-out via this lil' gag. They've become one of my favorite sites and after you visit a few times GeekTyrant no doubt will become one for you too.